Whether you’re starting a new business or looking to replace an old truck in your company’s fleet, buying a commercial truck — new or used — is a serious investment. It’s certainly not what you’d call impulse buying — or at least it never should be. This important purchase needs a thoroughly thought-out plan. First things, first: set the budget. Before you even start fantasizing about what kind of features you want in your truck, you need to know how much money you’re able to spend on it. Your price will set much-needed parameters for your search. Define the truck’s primary function. What will be your new truck’s main task? Understanding the needs that must be met by your new truck will help you determine which standard and special features should be included in the body. Consider other uses of the truck body. Will you need the vehicle to perform other tasks, perhaps in the future? Some trucks can handle multiple functions if loaded up with certain features at the time of purchase. So, think about how you can use this truck to best serve your business, now and in the future. Understand your cargo. What is the size and weight of the items you will be transporting? What is required to properly secure your cargo to prevent it from shifting and causing an accident? The answers to these questions will tell you what kind of capacity and shape your truck body needs. Loading/unloading needs. Will you be using your truck mainly at loading docks or will you be loading and unloading from street level? The latter scenario can benefit from a lift gate to help with loading. Will you be using forklifts to load and unload your cargo? If so, you might consider getting more durable floors and a larger storage area. Which options are “needs” and which ones are “wants”? You might get somewhat overwhelmed with all the options to choose from when it comes to such items as rear frame, floor thickness, rolling doors, interior capacity size, etc., but you need to keep in mind that these quickly bump up the cost. Stay focused on which options will best help you get the job done. If you’re looking for a used commercial trucks, look online, (i.e., www.autotrader.ca/used-heavy-trucks/Canada, www.truckandtrailer.ca, or www.arrowtruck.com). You can also search local advertisements online, and check out local auctions. Keep in mind that trucks for sale by private sellers may make it more difficult to acquire financing. Truck rental companies are also a good source; often they sell used trucks that are well maintained. Using the answers to the questions you asked yourself in the pre-purchase considerations stage, explain all of your needs to your selected dealer. Make sure you test-drive anything that you like. If you’re buying a used truck, it is best to look for ones that are at least 2007 or have 700 miles (1126.54 km) or less — this makes financing easier. 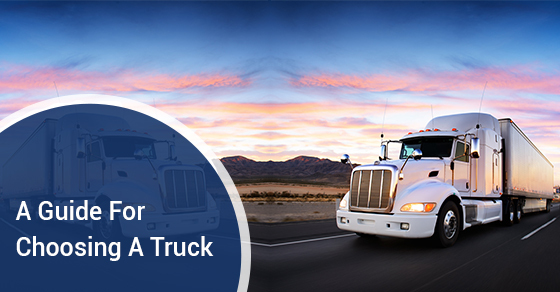 Choose the truck that meets your business needs best, and has a good safety record. Find out if the truck has been in an accident or has had extensive mechanical work done (this information should actually be given to you by the dealer automatically). Determine the value of the truck on your own. Research what your selected truck’s worth is before you make an offer. You can either check the prices of similar trucks with similar mileage and features or find out value estimates through such sources as www.vmrcanada.com. Have the truck inspected by a professional mechanic before you close the deal. Consider looking elsewhere if significant repairs are needed or there are issues with safety. Always negotiate the price. Use the information on the estimated value and the Inspection results to get the best price for the used commercial truck you want to buy. Then, all that’s left is finding truck equipment financing for your new or used commercial truck. Look for a financing company with a reputation for returning customers from an industry you’re in, and a transparent process that allows them to understand your business and provide you with a customized loan package that is right for you.